J$P Instant Transcript! Mansoor Ijaz on Iran, Uranium enrichment, mullahs, and how they connect to Dubai. 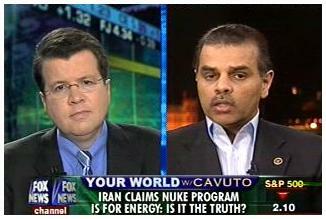 NEIL CAVUTO [FOX NEWS]: Is there any way Iran could be telling the truth here? From London, Mansoor Ijaz, he is Fox News's foreign affairs analyst. Mansoor, what do you think? MANSOOR IJAZ: Well Neil, I don't see that there's any possibility given what we know the facts are. It's important to keep in mind that when you're looking at the Iranian enrichment facilities, they have these facilities that have very large numbers of centrifuges in them. And when you have over a thousand centrifuges in a particular Uranium enrichment facility, that's not being done for civilian purposes. That can only be for military purposes that they have that in mind. CAVUTO: I've gotten a lot of emails, Mansoor, from a lot of viewers who took issue with my examining this whole peaceful intention thing. To a man or woman, those who were of that ilk, critical, said oil's a finite resource, it's going to run out eventually. Iran needs to look at alternatives. What do you think? IJAZ: Well it's true in one sense that Iran is the second-largest oil producer, third-largest producer in the world, second-largest in the gulf. But the fact is that they have to get all of their refined products from places like India, for example. And so it may be that there is some truth in the fact that they're not getting enough refined product back for whatever reasons there might be. But the structural problem here is that, if they wanted to produce only civilian energy, then they would not need to enrich beyond 5 or 7% in terms of the Uranium enrichment program that they've got. We already know, we've got evidence in the stuff that the IAEA has already found, that they've enriched beyond 20 to 25%. That's only when you're on the way to doing weapons grade Uranium enrichment, at 75 or 80%. CAVUTO: And then what are their intentions? IJAZ: Well for me it's very clear. I'm of the view, and I state this very openly, and I say this with the potential for putting a price on my head, that the Iranians are the world's leading sponsors of fingerprintless terrorism. They have mastered the art of being able to destabilize their enemies, whether it's France, or India, or Germany, or even the United States, by launching terrorist attacks or destabilizing types of civilian disorder, like I think they did in France. And they've got the capacity to do that now with nuclear weapons in people's hands, dirty bombs and things of that nature. And that's precisely, by the way, the unspoken, unwritten concern that we have with the Dubai ports deal. That because the Dubai government has done a devil's pact with the Iranian mullahs, that somehow or the other, one day we're going to find radiation bombs or dirty bombs on US ports. CAVUTO: So this is all part of a grander, sinister picture for you? IJAZ: No question in my mind that that's the case. I think the Iranian government has decided there's no way that they can attack the United States directly, that the way to keep the United States and its allies in check is to do what I call fingerprintless terrorism by supporting Hezbollah or groups of that nature as cells in different countries. And in the process of doing that, if they could one day arm them with nuclear materials, then they've got the full checks and balances that they want, so that the mullahs can never be moved out of power. That's why they have to go, by the way. That's the real reason that the Iranian mullahs have to be brought out of power. CAVUTO: Mansoor Ijaz, thank you my friend. Good having you back. IJAZ: Good to be with you.